Uttar Pradesh PEB board releases the UP Assistant Teacher Recruitment 2018 employment notice. Overall 69000 Assistant Teacher Vacancy in UP state is going to be filled by the single UP Teacher Notification. The chance of filling the UP Assistant Teacher Application Form is only given to the candidates who have passed in the UP TET exam. 6th Dec to 22nd Dec 2018 are the registration dates. UP Assistant Teacher Recruitment examination is 6th Jan 2019. In a short time after the UP Assistant Teacher Online Form the last date that is 22nd Dec 2018, the selection process has begun by the UP PEP organization. 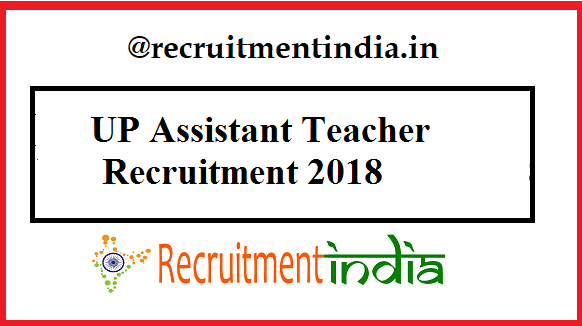 Latest Update(20th Dec 2018):UP Assistant Teacher Recruitment 2018 application form last date is 22nd Dec 2018 . Here is the employment notification for the UP TET Qualified candidates. To attain the applicability of participating in this UPPEB Assistant Teacher Recruitment 2018 process, plenty of applicants given the UP TET Examination and qualify in it. Uttar Pradesh State education board (UP PEB) only giving the chance of acquiring the Teacher job in the UP state to the job seekers released this UP Assistant Teacher Recruitment 2018 notification with 69000 vacancies. The applicants of this huge vacancy recruitment must have B.Ed qualification and UPTET qualification proof. While filling the options in the UP Assistant Teacher Online Form, postulant must give the UPTET exam number to proceed for the next process. Firstly applicants know the UP Assistant Teacher Recruitment requirements. Officials will decide what are the capabilities are needed for the candidates to join in this vacancy. Those contenders who possess the exact qualifications that are mentioned by the UP PEB undoubtedly they can become a competitor to this recruitment process. Much delay in the registering for the UPPEB Assistant Teacher Notification should not be done by the contenders. If they did at last they may miss the opportunity of getting the job in the teaching field due to the negligence. Hence all should aware of the Uttar Pradesh Assistant Teacher Application Dates. They are from 6th Dec to 22nd Dec 2018. Even though you have appeared for the UP TET exam again you have to write the online exam on 6th Jan 2019. For UP Assistant Teacher Posts, the educational qualification is Bachelor Degree with 2 yrs. B.Ed/ D.El.Ed/ B.T.C Exam Passed. For applying UPPEB Assistant Teacher Notification, one of the important criteria is the age limit. UP Assistant Teacher Selection Process is mainly based on the academic merit of the candidates. UPPEB board gives a good pay scale to the Assistant Teacher Vacancy. So UP Assistant Teacher Salary is as per the recruitment board rules. To submit the UPPEB Assistant Teacher Application Form, candidates have to pay the application fees for sure. All the category applicants must pay the fees. Contenders must know the UP Assistant Teacher Selection Process clearly. Since according to the selection process only, you have to plan the successful strategy to score marks in the exam. Absolutely there is UP Assistant Teacher written exam on 6th Jan 2019 so applicants you have to read the UP Assistant Teacher Syllabus. Why we are stressing the selection process mainly is due to the fact that s0me of the applicants are in the myth that there is n o interview round without the examination since they have appeared for the written exam. So to clarify all your doubts about the UP 69000 Assistant Teacher Vacancy recruitment process recruitmentindia.in detailedly explaining to you how the UPPEB recruitment board are choosing the candidates through the written exam and interview rounds. For the UP Assistant Teacher Application filled candidates, there has the chance of appearing for the exam. Form not submitted candidates could not make the entry into the filtering rounds due to the absence of the form. Certainly, all the UP TET qualified candidates will not lose this UP Assistant Teacher Recruitment. So due to a large number of upbasiceduboard.gov.in Assistant Teacher Online Forms, the website link might get slow down in the last dates of the application. Hence if they want to submit the form without any struggle, then choose the right link of UP 69000 Teacher Online Form here on this page and submit the form through it before 22nd Dec 2018. On the last date, the online portal of the registration form will get stuck due to heavy traffic of applicants.